September is a fantastic month to visit Hawaii. It’s a relatively quiet time in the Hawaiian Islands; hotel rates are less expensive and the weather is great. In this article, we’ll review all these important details in deciding if September is the best month for you to vacation in Hawaii. What’s Hawaii’s weather like in September? August and September are two of the hottest months in Hawaii. September weather in the Hawaiian Islands can be described as very summer-like with lots of sunshine and warm temperatures. Daytime high temperatures at most beach resorts average in the mid to upper 80s F. Nighttime temperatures only dip into the 70s F.
Kauai – 2.12 inches – This measurement is based on Lihue’s averages per Weather.com. Lihue is located on the southeastern side of the island and is not as wet as the North Shore, but not as dry as the South Shore. Oahu – 1.02 inches – This average is based on Honolulu’s rainfall per Weather.com, which will include Waikiki Beach. North Shore rainfall will be a little higher, while Ko Olina’s rainfall will be slightly lower. Maui – 0.38 inches – This average is based on Kahului’s rainfall per Weather.com. Kahului is where Maui’s main airport is, but it’s not typically considered a resort area like Wailea, Lahaina, Kaanapali and Kapalua. Kahului’s rainfall tends to be a bit higher than all the resort areas, with the exception of Hana on east Maui. Hawaii, the Big Island – 0.80 inches – This average is based on Kailua-Kona’s weather per Weather.com. Kailua-Kona is a popular resort area. Further north on the Kohala Coast, the weather tends to be even drier with only about 10 – 12 inches of rain for the entire year! Hilo, on the east side of Hawaii Island, is another story though, with an average of 9.94 inches of rainfall for September per Weather.com. Lanai – 2.09 inches – This average is for Lanai City in Lanai’s upcountry/highlands, which tends to get much more rain that the island’s sunny, beach resort at Manele Bay. Data sourced from Weather.com. Molokai – 0.93 inches – This average, per Weather.com, is for the airport just west of Kaunakakai town. Weather towards the east side will be rainier. This chart shows the general rainfall trends. Data was collected at the major island airports. For the Big Island, data is shown for the Kona airport only. 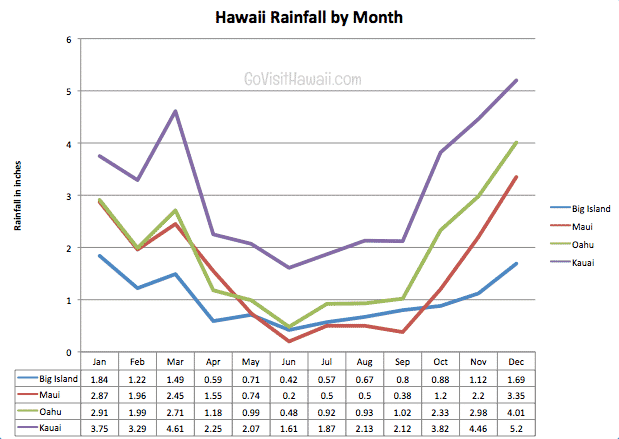 June, July and August are three of Hawaii’s driest months as a whole. September isn’t too much wetter by comparison. By September, the drier conditions tend to lessen the flow on some waterfalls. You should still be able to see waterfalls on the islands, however they may be less dramatic depending upon recent rainfall. Generally, Hawaii’s ocean temperatures are the most pleasant and highest in September and October. For more details, see our article on Hawaii ocean temperatures. It’s worth mentioning that August and September are the “peak” months of the Pacific hurricane season. That being said, hurricanes are relatively rare events in Hawaii and we personally wouldn’t hesitate to book a trip to Hawaii in either August or September or any part of the official hurricane season. Is September a popular time to visit Hawaii? Per our analysis of Hawaii Tourism Authority visitor statistics, September is the month with the least amount of visitors to the Hawaiian Islands. Why is September the least crowded month to visit Hawaii? The big reason is that summer vacation is over for families with school-aged children. Labor Day weekend, the first weekend of the month, is a popular time for Americans to take long weekend trips. We have been to Hawaii over Labor Day weekend. That weekend did feel a little bit more crowded, but not overly so. After the weekend, we felt that the crowds disappeared. Is September a cheap or expensive time for a Hawaii vacation? Per our thorough analysis of the cycle of Hawaii hotel rates, September is a very inexpensive time to visit Hawaii. The cost of flights is not as predictable. With September being a slow time for demand, it’s likely that the cost of flights will be below average. Anecdotally, as we’ve covered Hawaii travel for nearly eight years, we tend to see fall fare sales begin in late July. By mid-August, fall fare sales tend to take another slight reduction. See our strategies for saving money on airfare to Hawaii for more information. Are there any special festivals or reason to visit Hawaii in September? Please note that festival dates are subject to change. For a comprehensive list of festivals and events, search GoHawaii.com. In summary, is September a good month for a Hawaii vacation? The answer to that question isa resounding yes! With some of the key factors in making a great vacation — low hotel rates, low rainfall levels and no crowds – September is definitely one of the best months to go visit Hawaii. Have you been to Hawaii in September? How was your visit? This article is part of our month-by-month analysis helping you to identify the best time for you to visit Hawaii. See this article, Best times to visit Hawaii, for links to other months. I agree I found September in Hawaii to be a great time to visit. The only disappointment was the waterfalls were low flow or barely flowing. Tours/adventures taken were not packed full, which made them more enjoyable. Visiting the sights was also nice. While they were busy it wasn’t packed so you could enjoy them, also provided more chances to mingle with the locals. Hotels also were great on rates, less crowded (not having to fight for a lounge chair at the pool). TIP: In general no matter what time of year depending on where you go and on which island you are on… you might be able to avoid the cruise ship docking schedule and have some things to yourself which is a plus. Many of the ports of call (towns) list scheduled dockings on their municipal website. We are on the Big Island right now, Sept 9th and there is no one here. The weather is great. I would recommend a September trip to the islands. Great to hear Liz. Enjoy! Just got back from my first trip to Maui. Spent most of the time at the resort pool and beach (hubby had a conference and I didn’t have a rental car). Not super crowded; quite a few honeymooners. A post-Labor Day trip worked for me as there were fewer children at the resort. Was surprised at the HIGH humidity! Did not wear some of the clothes I packed as the material was too heavy, even though it is considered summer clothing for Colorado. Most women were wearing cute but casual skirts or dresses; saw a few capris and one pair of jeans. Took a couple of 3/4 length sleeve tops and did not wear them. Walked along the beach every morning around 7 on the paved path (Wailea) and was drenched at end of walk. Good to know for next year’s trip. Depending on your lifestyle, you could shop at REI or a resort-wear shop for lightweight clothing. Should we be concerned about the hurricanes and high winds 9/15-9/5/2015? Linda – normally hurricane season in Hawaii is very, very quiet, however 2015 has been unusually busy for tropical storms. We’re not quite sure what you meant by “9/15-9/5/2015”. Our recommendation would be to check and watch local forecasts from HawaiiNewsNow.com and KHON2.com. Also, speak to the folks at your accommodation for advice as well. It’s definitely warm enough to swim in September — probably somewhere around 80 F.
Regarding sharks, yes, there are sharks in Hawaii just like there are sharks at any other coastline and/or island. Which is the best Island in Hawaii for families with regard to accommodation, activities and cost? we hope to visit Hawaii in September 2016,will that be a better time ? Hi Sheila. I just won a trip for 2 to Waikiki on our local radio station. 4 days – 3 nights. we are going to add 2 or more nights to it. My wife and I are in our mid. 50’s we are thinking around sept. 22. Is everything to see and do open that time of year because will a once of a lifetime trip for us. Yes, all the attractions are open year round on Oahu and generally across all the Hawaiian Islands. Possibly. Where and when is unpredictable, though. We are planning to travel Hawaii in either September, October or movement this year, 2016. We want to catch some nice beginner intemediate 3-4ft waves for a week. Can you say where is the best base in hawaii to stay for a week of surfing – we’ll travel around sight see after that frst week. Fiona – we’re not surfers, so we can’t say for certain. Also, predicting where the waves will be is simply guesswork as it all depends on the weather patterns. For example, 3-4 foot waves may be on the south shores one day, east shores the next and north shore the next. With the exception of the Big Island, it’s easy to drive from one side of an island to the other to find the waves. My husband and I are going to Waikiki and Maui for an anniversary trip this September. Our main goal is just lounging at the beach because we rarely have down time. I have been to Waikiki before, but not Maui. Is it recommended to reserve beach chairs and umbrella’s through our hotel ahead of time, or will it be slow enough that we can just do that when we get there? Our experience has mostly been that you can only reserve the “day of” and not ahead of time. Each hotel has their own policies so check directly with the hotel(s) where you’ll be staying. Hi, my wife and I will be going to Oahu this September, and I’m very interesting in swimming with dolphins. Where can I go to do that activity? Sea Life Park also offers a dolphin encounter program, but we’ve not tried it. I going on Hawaii cruise out of Vancouver on September 13-23 for the first time. As i have breathing problem i wandering about hot and humid weather over there on those dates; some people told me that is not so hot because of constant breeze? Can you please tell me about temperatures at that time what to expecting or should i better planing stay in ship by air condition? Hawaii has some of the cleanest air on the planet, so that’s a plus. We don’t have any way of predicting exactly how the weather will be for your specific dates. No one knows. If the trade winds are blowing, they do make the hot temps and humidity more pleasant. They are usually the predominate winds, but not always and there can be some days with little wind at all. We don’t have any way of knowing which way and how much the wind will blow on your specific visit. Hello my fiancé and I are looking at possible honeymoon destinations. Is there anywhere in Hawaii you’d recommend. A few locations possibly? The month would be in September of next year. Do you think that would be a good month to go? We always say that anytime is a great time to go to Hawaii. We don’t have any additional information to add about September that’s not already included in the above, very detailed article. We are thinking of doing the week long Island cruise with Norwegian in the first half of September this year. Do you have any comments about the overall quality of the Norwegian line? Specifically their accommodation and food standards? We haven’t taken that or any cruise in Hawaii, so we can’t speak from experience. We have cruised at other destinations and have found Cruise Critic to have loads of great reviews of specific ships and sail itineraries. I’m sure they have insights on this Hawaii Norwegian cruise. Went to Maui in October 2016 for our 50th anniversary. Stayed two weeks and had an unbelievable time. If you live in the western United States Drive your self to Hana. You will be familiar with the road and can stop more often than a tour. If you are in the mood for a once in a lifetime lunch go to Mama’s. (200-300) drinks and food.Stop at the aquarium in Maalea. Buy your supplies at Costco. Stay near the beach. going to kauai in sept. I want to stay at a resort that has the nicest swimming and prettiest beach. i heard po pui area has the best beaches. where should i stay. any suggestions??? or locations in kauai that have the nicest swimming beaches. Read this: https://www.govisithawaii.com/kauai-where-to-stay/ In my opinion, the beach in front of the Marriott in Lihue is one of the best bets for good swimming conditions. Me & my husband are planning to visit iut first time to Hawaii. We really need advise which islands that we need to visit as we are planning to stay for a week or so. Thanking you & look forward to have any suggestions. Hello Luna from Sydney! Here’s a helpful resource — First time visitors guide: https://www.govisithawaii.com/first-time-visitors-guide-to-hawaii/ Note that the first couple of bullet points discuss how to pick an island and also how many islands to visit for your available time. Hi I’m hoping to take my daughter to Hawaii in Sept but not sure which Island we should go to or stay at. Can you advise which is the best Island for what please? Hi! My boyfriend and I would like to visit Honolulu and Oahu this coming September. We are both 20 years old. We are highly anticipating to go skydiving as well. As we will only be there for around 7-8 days, what activities would you suggest to really dive into the local culture of Hawaii? Also, what kind of accommodation would be most economical options? Thanks! I had gone to Oahu in June one year and the waves were quite big for a peaceful snorkeling; water hitting me in the ears, stirring up sand and blocking visibility, pushing me around and up to the sharp rocks of Shark’s Cove! I want to go in September this year, is there a “calmer” time for the water? The ocean isn’t as predictable as we’d like. In general, summer months (even including September) are calmest. I’m surprised you had a rough time of it in June. Perhaps there was an unusual swell? Hello Sheila, thank you for such a great information! We are planning to go to Hawaii in September. Our one main requirement is to stay by the beautiful, clear water, swimmable beach. Shady trees or umbrellas will be a bonus. We are not pool people, but love swimming in the ocean. It can be on any island and will stay in either hotel or airbnb. Could you please give us a few suggestions? Thanks a lot! There are many places in Hawaii that fit that criteria. Our suggestion would be to choose an island and go from there to find your resort. Thank you! We are leaning toward Oahu or Big Island. Would you be able to suggest a few beaches? Thanks! All beaches where resorts are on Oahu are generally swimmable this time of year. My husband and I are thinking of going in September with our twins they will be 14 months old? Would you say many people take their small children to Hawaii? Could you recommend a particular island that is kid friendly? Most people visiting Hawaii are couples. That being said, we’ve seen kids of all ages on family vacations in Hawaii. Check out our list of the best places for family vacations. https://www.govisithawaii.com/2016/02/10/where-are-the-best-places-for-family-vacations-in-hawaii/ Note that there’s a Disney resort, Aulani, on Oahu. You can’t go wrong with Disney for being kid friendly. Hi Sheila. I am looking to go to Hawaii next year. I hear September is a good time to go. My partner and myself love sight seeing, shopping and relaxing occasionally. We do like to stay in nice places. Do you have any recommendations or websites I can visit. We have loads of great information here. A great place to start is with our First Time Visitor’s Guide to Hawaii: https://www.govisithawaii.com/first-time-visitors-guide-to-hawaii/ that guides you through from choosing an island or islands to where to stay to what to pack. Hi, I am planning on travelling to Hawaii by myself in Sept/Oct this year. Do you have an suggestions of what to do or where best to stay as a solo traveller? Travelled to Hawaii many years ago. Prefer swimming in pools but like walking along the beach, sightseeing & what Hawaii has to offer, shopping of course & anything else that may be happening. Thanks. Our island itineraries are good for both solo and group travelers. See this link for choosing an island https://www.govisithawaii.com/2010/06/28/how-to-pick-the-best-hawaiian-islands-for-your-vacation/ Our itineraries are listed there.